Out in the Texas Hill Country, far away from city lights, the stars burn big and bright against a deep black firmament upholding the Milky Way. Milky Way flows like a bright celestial river with eddies and currents concealing deeper mysteries within. In their midst, the North Star shines like an ethereal conductor, directing them all. The wonders of our night skies are in jeopardy from encroaching man-made lighting. There are only a few really dark places left in the United States where the Milky Way is easily seen. Many children and younger people have never seen the Milky Way. Putman Mountain Observatory is dedicated to preserving our night skies and promoting effective and efficient lighting only where it is needed. To help with night sky preservation efforts, Putman Mountain Observatory is a member of the Hill Country Night Sky Coop. More information about preserving our night skies can be found at the International Dark Sky Association which is an international organization that is a leader in night sky preservation efforts. The Texas Chapter of the IDA also has resources and information about efforts to preserve the night skies in Texas. 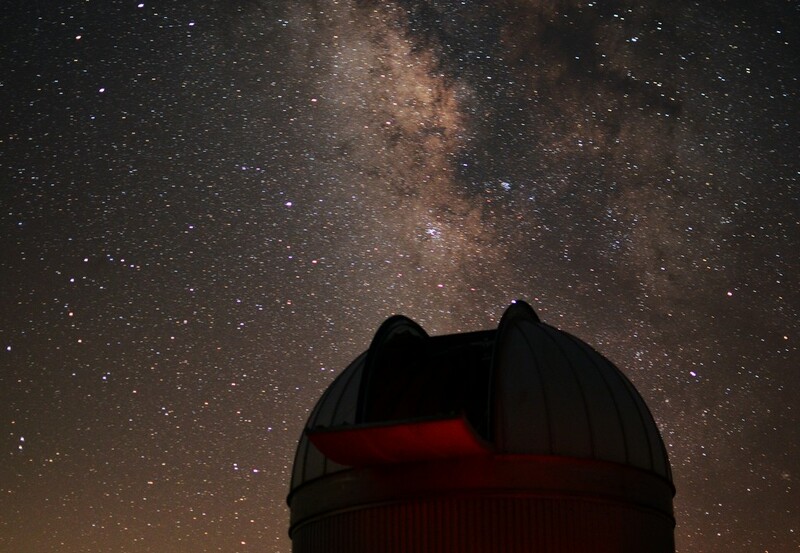 One of our efforts to support night sky preservation is by quantitatively monitoring the quality of the night time sky Specifically, precise measurements of the relative brightness of the night time sky over the observatory are made every night and logged. The information below explains how this is done and what the measurements mean. The real time measurements each night are continually posted to this page as a public service. Relative sky brightness is measured with a Sky Quality Meter (SQM) made by Unihedron that records nightly readings and logs them for continual monitoring. 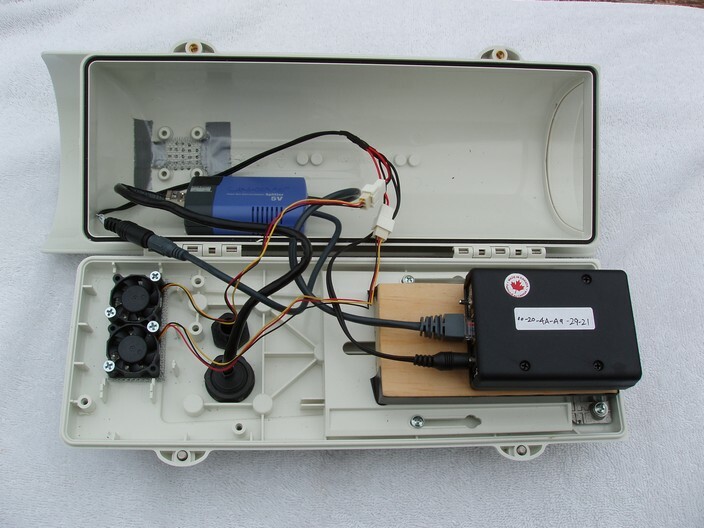 The SQM is mounted in a weatherproof enclosure and directly wired to a weather server that records the sky brightness readings from the SQM. 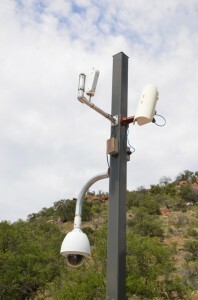 The SQM enclosure is mounted on a permanent pole along with other weather monitoring instruments and pointed upward to measure the darkness of the night sky. The meter is activated each night and computes an average of three measurements every 15 minutes. The measurements are recorded by the weather server to keep track of how dark the sky is from night to night. The weather server is running SQM Reader Pro by Knightware Software. The following information shows real time sky darkness measurements taken from the Sky Quality Meter. These measurements are updated approximately every 15 minutes. No readings are taken during the daylight hours. Naked Eye Limiting Magnitude (NELM). The chart below indicates the current sky darkness readings in Mag/Sq Arcsec (magnitudes per square arcsecond) and NELM (naked eye limiting magnitude). The higher the number in Mag/Sq Arcsec and NELM, the darker it is. These measurements are explained in more detail below. A reading greater than 21.5 Mag/Sq Arcsec or 6.0 NELM is considered a very dark sky. The graphs below show the sky darkness fluctuations over time. One chart is based on NElM measurements and the other is based on Mag/Sq Arcsec. Measurements are taken every 15 minutes and posted to the graph in real time. Measurements are taken starting at sunset and continue through the night until sunrise the next morning. No measurements are taken during daylight hours. Fluctuations in sky darkness are caused by the rising and setting of the moon, the milky way passing directly overhead and man-made sources. 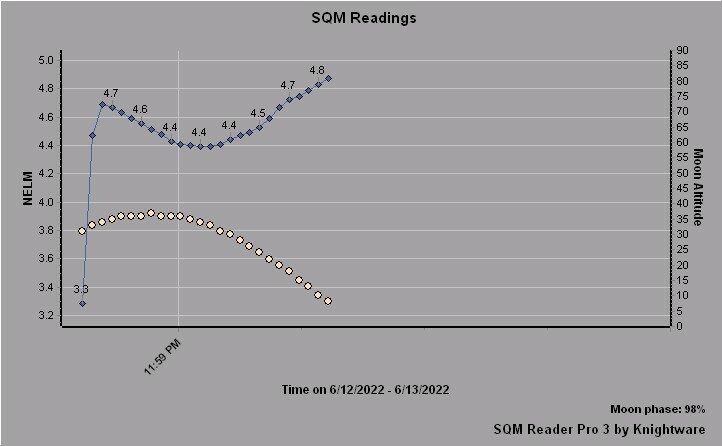 Readings greater than 22.5 Mag/Sq Arcsec typically indicate the sky is clouded over which makes the environment very dark because there is no star light or any other light coming from the sky. The observatory has installed a TESS photometer. TESS stands for Telescope Encoder and Sky Monitor. The TESS photometer is a compact device that measures sky brightness each night. The Tess is designed by astronomers and calibrated at LICA laboratory at the Universidad Complutense de Madrid. The quality of the data is scientifically accurate. You can learn more about it here. The charts below are produced by the TESS photometer and updated every 5 minutes. 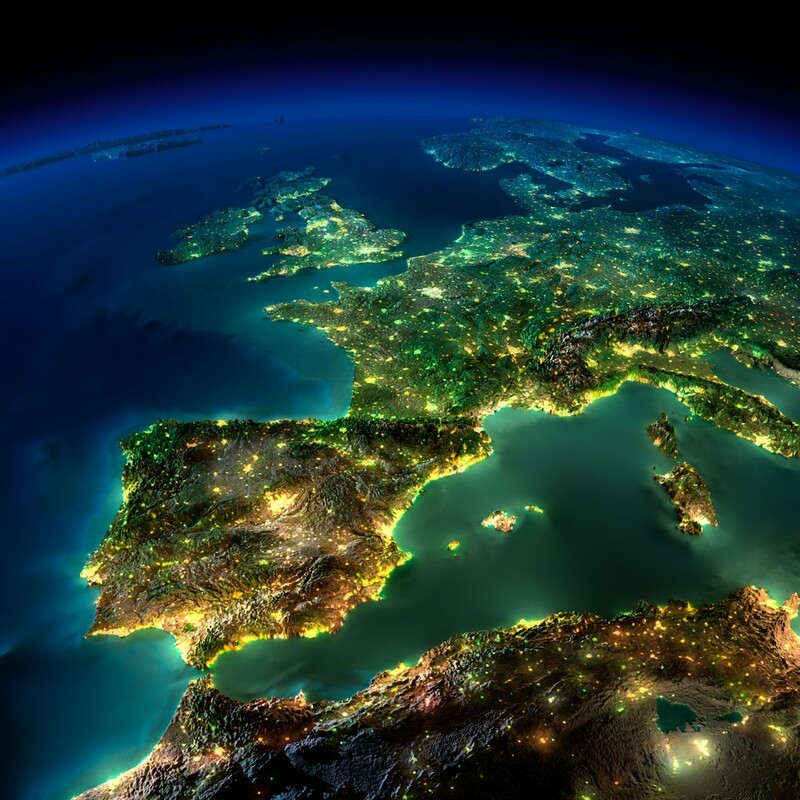 A number of factors contribute to how dark the night sky is, including the moon, milky-way, airglow from gases in the atmosphere, and the largest contributor – light pollution from man-made sources of illumination. The current moon phase, rise and set times for today are shown to help interpret the moon’s effect on relative sky brightness. Both measurements use the term “magnitude” which comes from the term “apparent magnitude” that astronomers use to describe how bright an object appears in the night sky. Apparent magnitude was originally based on a scale from 1 to 6, with 1 representing the magnitude of a particular reference star and 6 representing the faintest object that can be seen by the naked eye. Going from one magnitude to another represents a change in brightness of 2.5 times. This means an object of magnitude 3 is 2.5 times brighter than on object of magnitude 4. The important point to remember is that brighter objects have smaller magnitudes and fainter objects have larger magnitudes. The magnitude scale can even have negative numbers which means the object is very bright. For example, the brightest star in the sky is Sirius and has an apparent magnitude of -1.6. Sirius is near the constellation Orion in the winter sky. Therefore, Naked Eye Limiting Magnitude or NELM simply represents the faintest magnitude that your naked eye can perceive under the particular sky being measured. A NELM of 6.0 means you will be able to see objects as faint as magnitude 6.0 which is about as faint as the human eye can see. A NELM of 2.0 on the other hand, means the sky is relatively bright due to the presence of the moon in the sky or you could be in an urban location with a lot of light pollution. Some of the darkest locations on planet Earth have a NELM of around 7.0 to 7.5. Very dark indeed. Astronomers also use Mag/Sq Arcsec to measure relative sky darkness. There is even a formula to convert from NELM to Mag/Sq Arcsec. Mag/Sq Arcsec is simply the apparent magnitude (discussed above) for a certain square area of the sky represented in arc seconds. A square arc second is a square area of the sky that is one arc second on each side. An arc second is a very small measurement. For example, Jupiter looks very small in the sky, but through binoculars it does have a disk-like shape and a small diameter. Jupiter’s angular diameter ranges from 30 to 50 arc seconds. Therefore, Mag/Sq Arcsec means the brightness (expressed in apparent magnitude) of a one arc second square area of the sky. This is very small and almost a single point in the sky. The Bortle Dark-Sky Scale is a numeric scale that measures the night sky’s naked eye brightness and stellar limiting magnitude of a particular location. It quantifies the ability to observe celestial objects and the interference caused by light pollution and sky glow. John E. Bortle created the scale and published it in the February 2001 edition of Sky & Telescope magazine to help observers compare the darkness of observing sites. The scale ranges from Class 1, the darkest skies available on Earth, through Class 9, inner-city skies. In the chart below, the Bortle scale is depicted with a color coding scheme along with Naked Eye Limiting Magnitude (NELM) and Mag/Sq Arcsec so you can compare the different measurements. 3 Rural Sky 6.6 – 7.0 21.89 – 21.69 Low light domes (10 to 15 degrees) on horizon. M33 easy with averted vision. 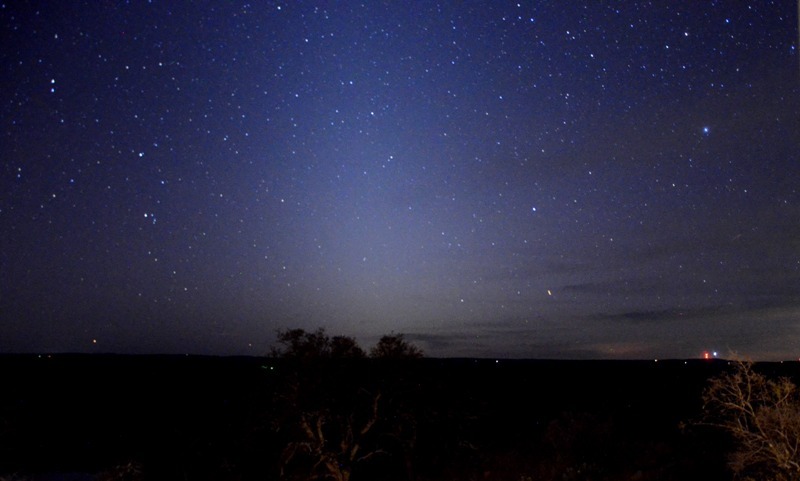 4 Rural / Suburban Transition 6.2 – 6.5 21.69 – 21.25 Zodiacal light seen on best nights. Milky way shows much dark lane structure with beginnings of faint bulge. M33 difficult even when above 50 degrees. 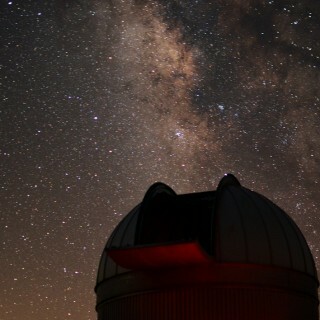 4.5 Suburban Sky 5.9 – 6.2 21.25 – 20.49 Some dark lanes in Milky Way but no bulge. Washed out Milky Way visible near horizon. 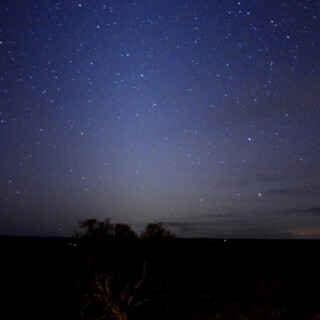 Zodiacal light very rare. 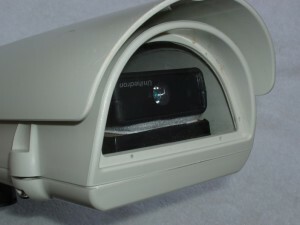 Light domes up to 45 degrees. 5 Bright Suburban Sky 5.6 – 5.9 20.49 – 19.50 Milky Way washed out at zenith and invisible at horizon. Many light domes. Clouds are brighter than sky. 6 – 7 Suburban / Urban Transition or Full Moon 5.0 – 5.5 19.50 – 18.38 Milky Way at best very faint at zenith. M31 difficult and indistinct. Sky is grey up to 35 degrees. 8 – 9 City Sky 3.0 – 4.0 < 18.38 Entire sky is grayish or brighter. Familiar constellations are missing stars. Most people don’t look up. Where is the Sky Darkness Monitoring Station? The monitoring station is located about 20 miles north of Fredericksburg, Texas. In the sky darkness map to the left, the monitoring station is marked with a cross. The orange colored spot directly below the monitoring station is Fredericksburg. The very bright area further South is San Antonio and the bright area toward the Southeast is Austin. The sky darkness map is color coded to match the Bortle Scale chart above.